* Setup Window: (1) Added ability to display both Registered and Unregistered modules in the Suite. 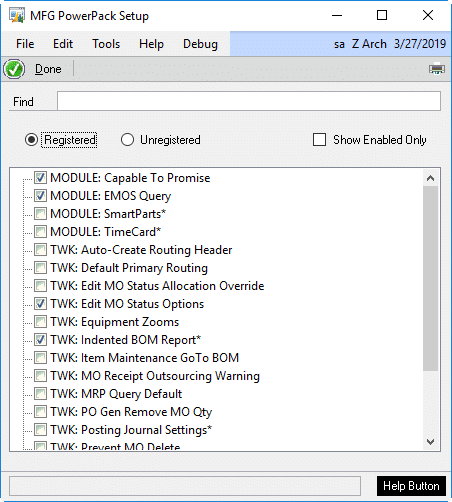 (2) Window now checks if MFG and/or Field Service are installed and only displays Modules and Tweaks that require those modules if they are installed. * Capable To Promise (CTP): Added additional menu on SOP Inquiry to open the CTP window. 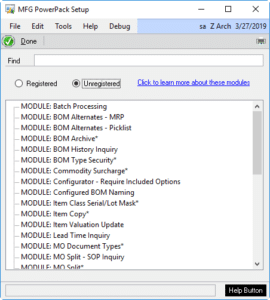 * Where Used Inquiry: addressed issue when zooming to a new Inventory BOM when a current BOM is displayed and it has changes. The MFG PowerPack Setup window now has radio buttons to display Registered and Unregistered modules. 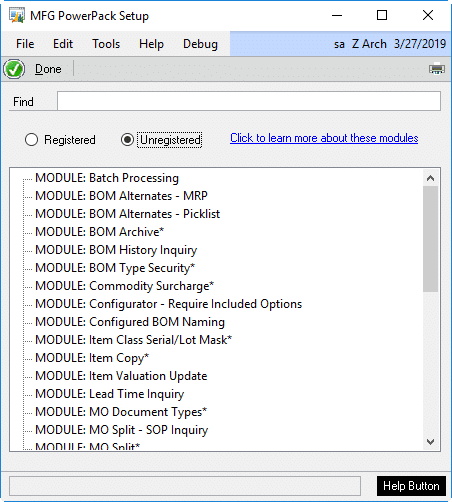 The Unregistered Modules view shows all modules contained in the Suite that are not available with the current Registration Key. MFG PowerPack contains many modules that required the Dynamics GP Manufacturing module and/or the Field Service module. The Setup window will not only display MFG PowerPack modules that can be used (i.e. 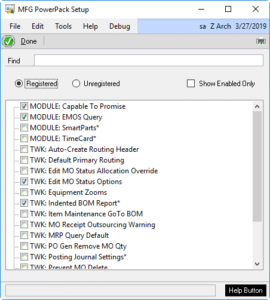 it will not show a module if it requires Manufacturing and the Manufacturing module is not installed).